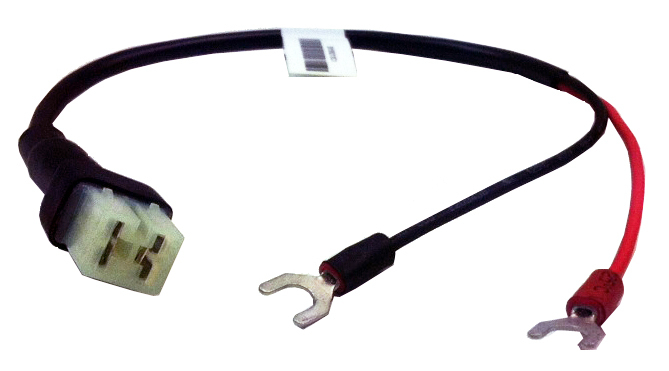 Spade terminals to feed it directly from a battery. 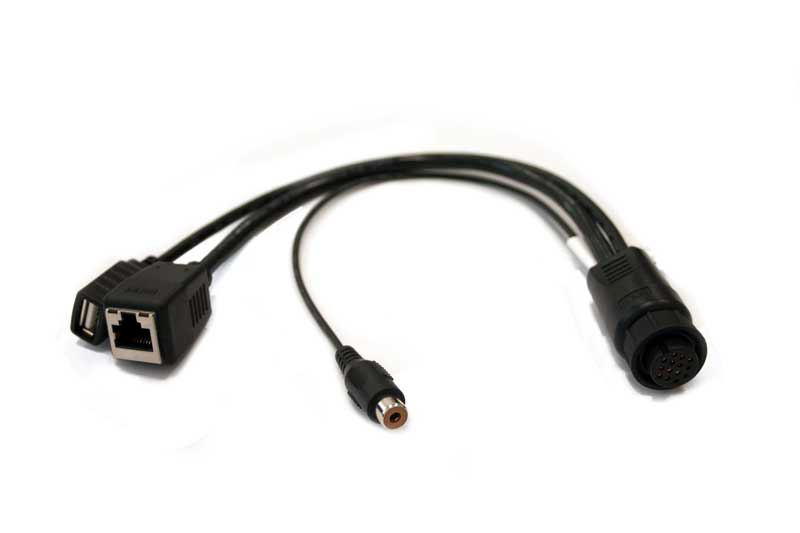 Connect the external antenna into a DB9 connector. An incredibly bright 7” sun-light readable display with 16 million colors. Use multiple-finger gestures on the multi-touch display to scroll menus or to zoom in and out the field view. When in field view you can keep an eye on all the most important data and everything is just a touch away thanks to the collapsible menus. 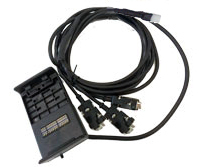 You can also use the remote control to ensure precise commands even when driving over bumpy fields. 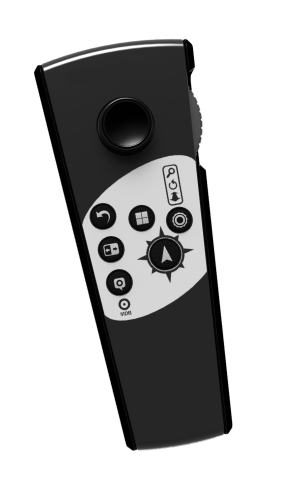 An intuitive interface with large buttons for each function. An the updates? Never been so easy, through wi-fi! 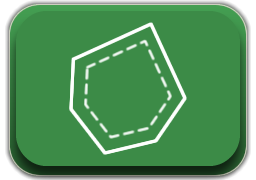 Start creating your fields’ database: measure your field boundary, calculate the area and save the position of obstacles or soil samples. Choose the guidelines for your activity and follow the guidance cursor to correct your driving. 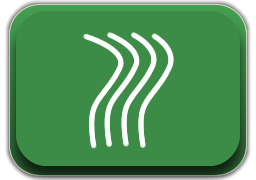 Choose among A-B parallel lines, identical curves, adaptive contour or pivot guidelines. Save and recall guidelines for further activities in the field. Make sure the guidance line is always visible through the circle on the top of the smart cursor. The cursor will help you understand the tractor turn radius, to quickly correct your steer. When starting a job, you can create a headland within the field boundary, based on your working width. The Headland Management function is very useful for irregular fields such as triangular fields. When active, the Automatic Section Control will close the sections of the implement at the headland border, the headland can be worked at the end, avoiding unnecessary overlaps. The headland function can be used with A-B parallel guidelines, identical curves and adaptive contour guidelines. 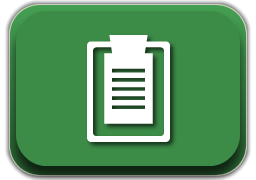 G7 Plus Farmnavigator records data for each Job: farmer, activity, field, implements used, products used, worked area, total time etc. 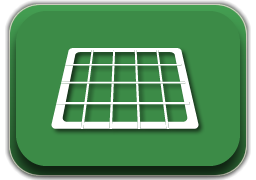 Manage your data: fields and jobs can be exported to Google Earth as .kmz files. Create a profile for each implement and activity e.g. seeding, fertilizing, or spraying: set the working width, or the number of boom sections and their individual width. Then choose a profile and get indications for manual boom switch control to start reducing costs and protecting the environment. 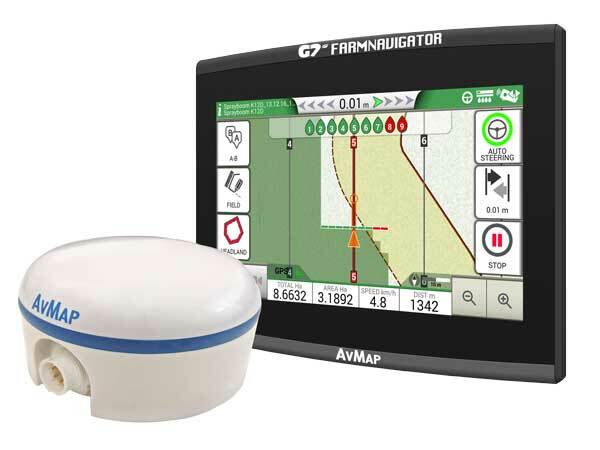 Connect a compatible controller to G7 Farmnavigator for higher precision and greater productivity. 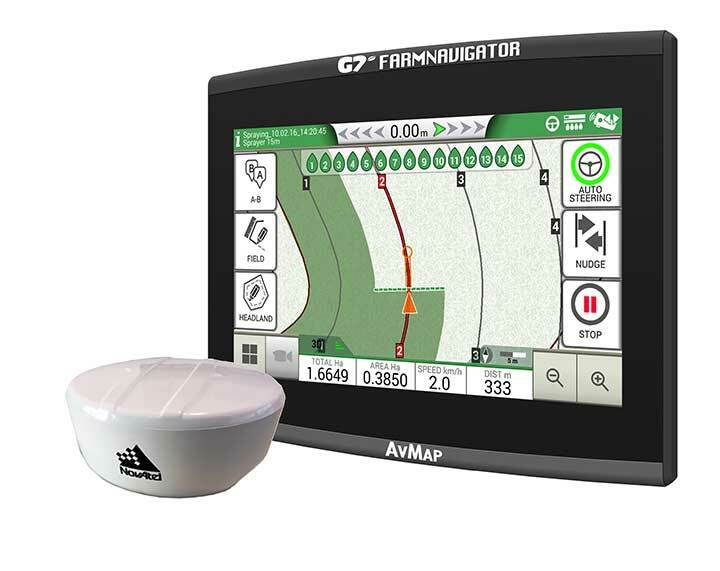 G7 Farmnavigator calculates the exact treated area and controls automatically the boom sections based on the position received by the DGPS antenna. You can still close or open manually a section from the display forcing the automatic control. 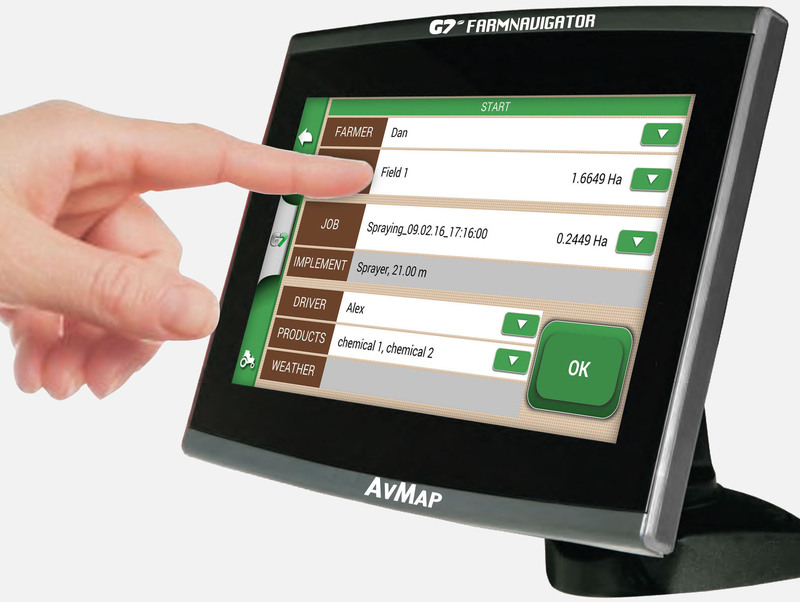 G7 Plus Farmnavigator can be used with the Farmnavigator Auto-steering to achieve the maximum precision and reduce the operator fatigue. 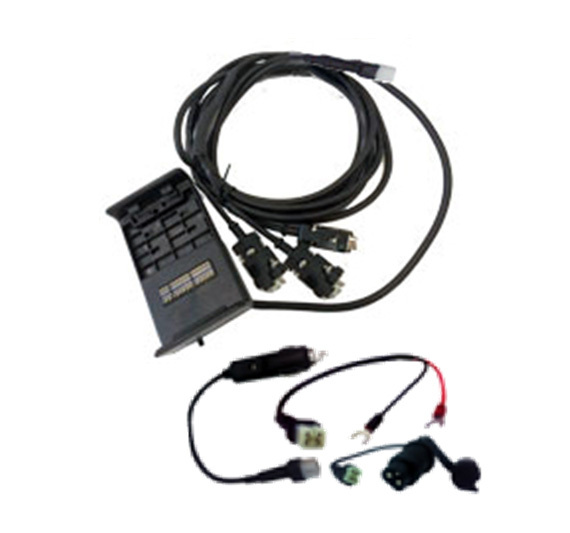 The Farmnavigator Auto-steering System controls your vehicle steering and helps you stay on track, perfectly following the guidelines set on the Farmnavigator. You can disengage the Auto-Steering by firmly grasping the steering wheel; you can engage it again very easily by tapping the icon on the Farmnavigator display. 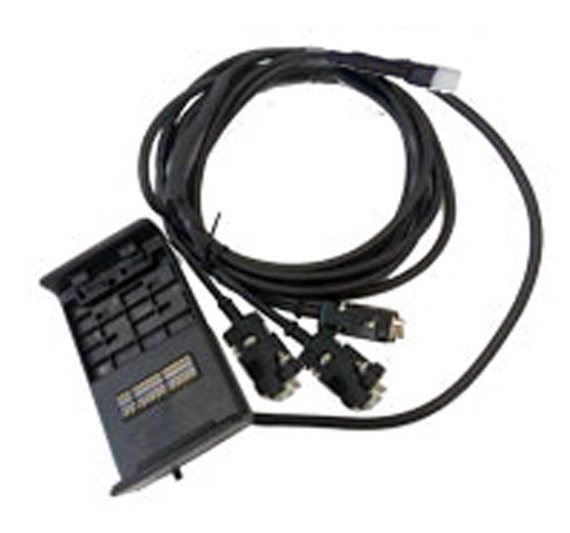 Control your camera from the G7 Farmnavigator display through the USB-VideoIN-Ethernet cable provided in the box: perfect for rear view or to monitor sensitive points of the implements. 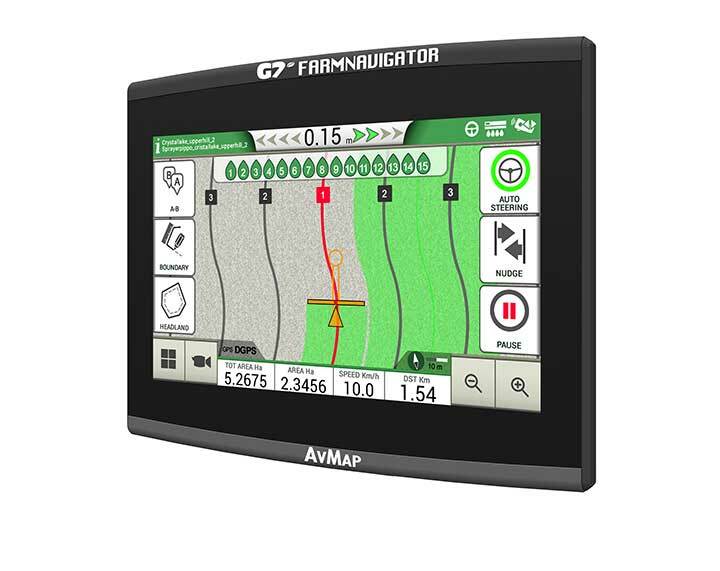 You can use G7 Plus Farmnavigator all year round to navigate to you fields or to anywhere else, thanks to the Road navigation function and HERE maps included! Listen to turn-by-turn instructions with the Bluetooth speaker. 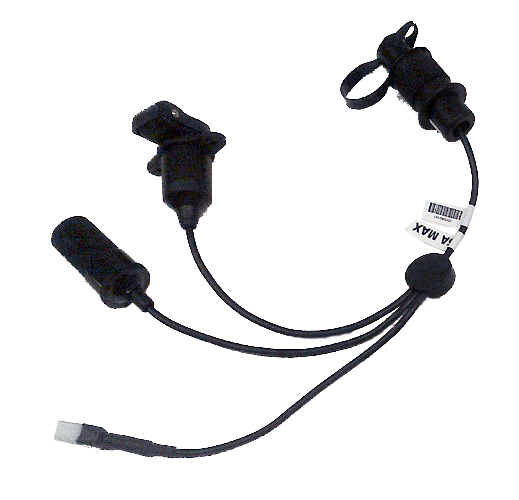 GPS, GLONASS, GALILEO SBAS tracking, 72 Channels, Update rate up to 10 Hz. 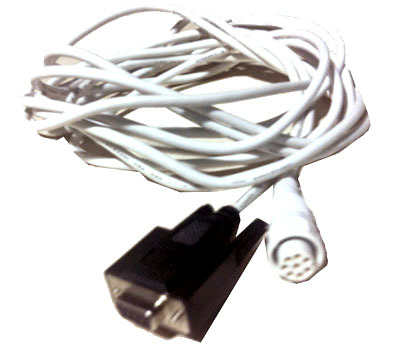 (Download instructions for connection). Exceptional performance even when the sky is obstructed by trees. The new more compact and robust shape provides a firm grip on the support surface and enables the safe transit of the vehicle even in the presence of dense vegetation. 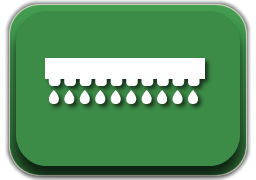 Ideal for basic precision operations: Mapping, Fertilizing, Spraying. Great quality / price ratio! L1 GPS + GLONASS, SBAS tracking, Update rate 10 Hz, GLIDE technology for ultra-smooth positioning and exceptional pass-to-pass accuracy. 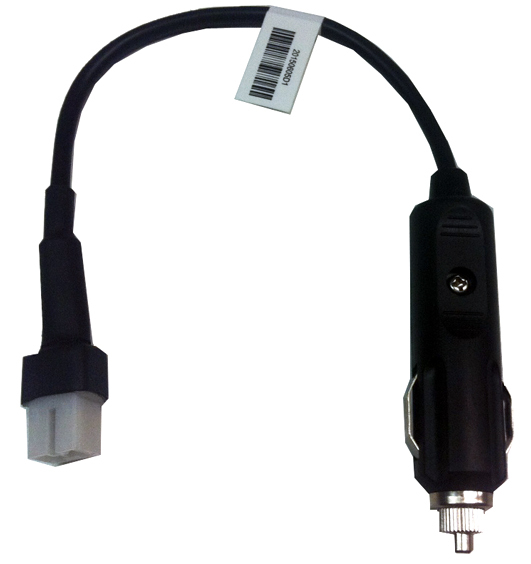 Ideal for basic precision operations + manual and /or Auto-steering applications. 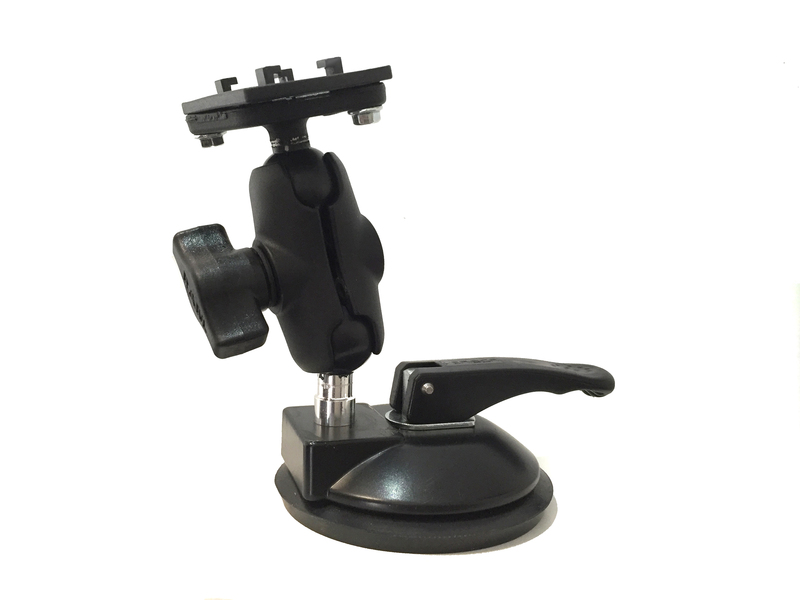 L1 GPS + GLONASS, SBAS tracking, 120 channels, Update rate up to 20 Hz, GLIDE technology for smooth and consistent positions for pass-to-pass applications. 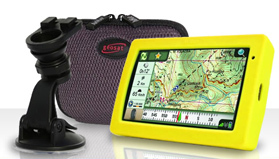 Upgrades available for L2 GPS, L-Band and RTK. 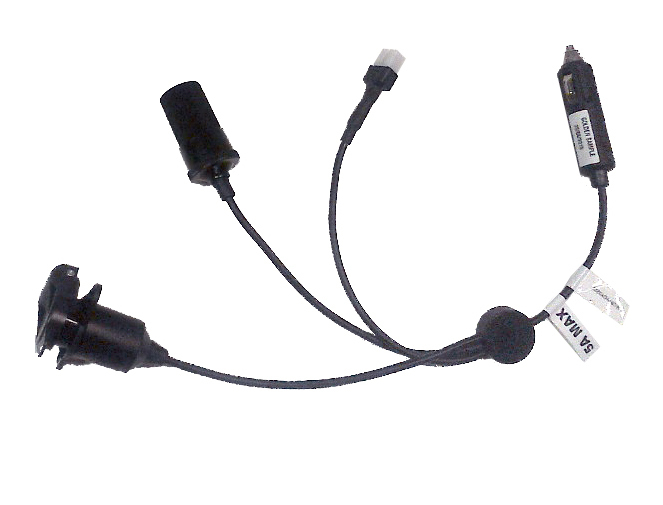 Ideal for high precision Auto-steering applications. 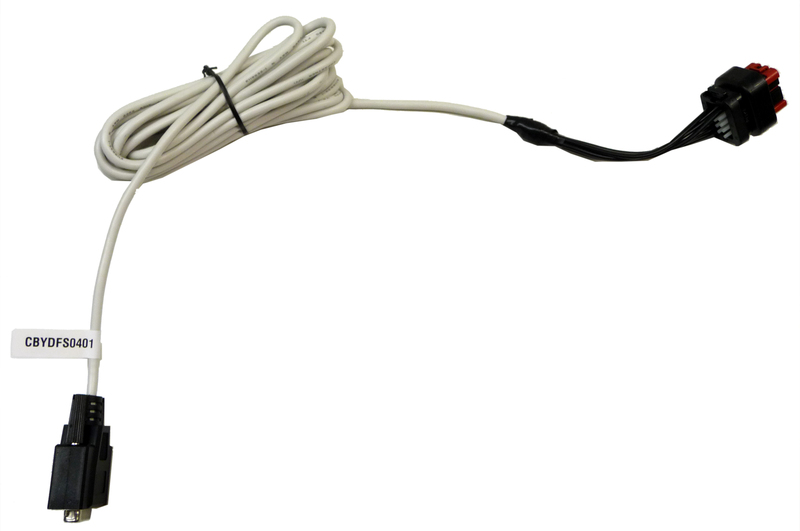 Add to the Farmnavigator a smart GPS receiver: you can choose any GNSS receiver with NMEA0183 output. We offer three options for different needs and budgets. 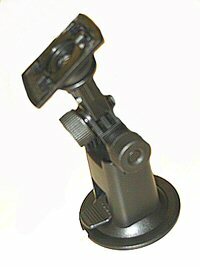 When choosing the receiver, ask yourself: what do you need it for? What is the precision required by your job? Do you need it for basic precision operations such as mapping your fields, spraying, fertilizing, or do you really need auto-steering for more precise applications? 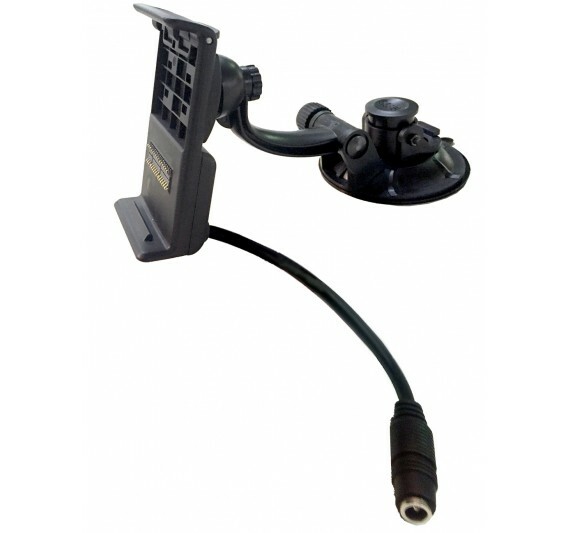 Powered bracket with 3 adapters: cigarette lighter adapter, Cobo adapter, spade terminals adapter.